Personal loss aside, I saw this quip in today's newspaper and realized it is the broader-felt and therefore greater tragedy. 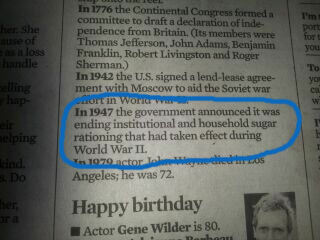 What if the rationing of sugar never ended? What if hfcs was never added to food? What if obesity never became the threat to our national health that it is today? What would we be writing about instead? Good question. I have no idea, but I'm sure things would be a little different. My guess is artificial sweeteners would have been mainstreamed faster and people would be just as fat. . .little hope of it going back to Little House on the Prairie sparse use of sweeteners days. That's a pretty profound and head-hurting concept to consider, Jane. Seriously. Imagine if sugar production and consumption were LIMITED instead of subsidized and ubiquitous? Norma also gets points - if sugar was not limited with the exception of removing subsidies and if it were simply not allowed in things like vegetables - what would the world be like? Rationing of sugar wouldn't stop us. The more you tell people they can't have something the more they want it and find ways to get it.